Andrea Martin, Tracee Chimo and Campbell Scott in Noises Off. Michael Frayn's Noises Off, when it premiered back in 1982 in London (with Patricia Routledge) and when it opened in 1983 at the Atkinson (with Dorothy Loudon), was farce comedy par excellence; we didn't quite realize, in those days of Cats and Torch Song Trilogy, that broad, knock-down stage farce could not only be viable but classy. When the play was revived at the Atkinson in 2001--with a cast headed by Patti LuPone and Peter Gallagher, under the direction of Jeremy Sams--this playgoer found the results funny; or, rather, merely funny. Which was not enough at all. Far more problematic was Peter Bogdanovich's earlier, star-studded motion picture version, which suffered immediate death with critics and audiences. Slinging the prop sardines was Carol Burnett--still, in 1992, America's funniest lady--supported by the likes of Michael Caine and Christopher Reeve. The combined lack of power of film and revival was enough to make one wonder whether an undue portion of the magic of that original golden production of Noises Off came from alchemist (i.e. director) Michael Blakemore. new revival from the Roundabout. 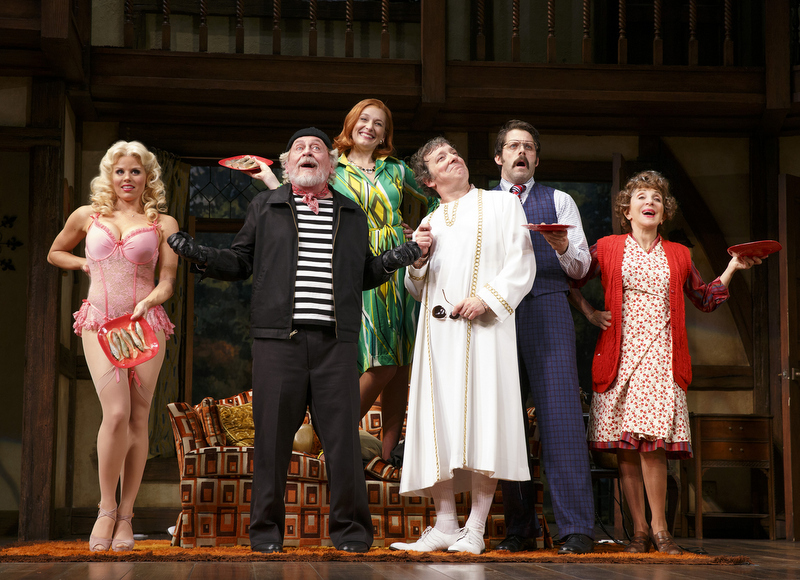 Today's report--and it's a happy one--is that this Noises Off is splendidly delirious fun. Director Jeremy Herrin, whose prior Broadway offering (Wolf Hall) was impressive but did not exactly suggest a deft comedy hand, turns up with a perfectly-calibrated production which brings full value to Frayn's text while adding layers of visual humor that leaves audiences hooting with delight. The Roundabout, which sometimes seems to cast its productions with any film or TV star it can sign, has in this case been content to restrict itself to talented stage actors who have heretofore displayed comic flair. This works out capitally well, and results in one of the finest Roundabout outings since Twelve Angry Men. Andrea Martin--in the central role of Dotty Otley, TV's "lolly lady"--is indeed a star along Broadway; not a ticket-selling one, but a two-time Tony-winner who seems altogether incapable of giving an ordinary performance. Martin, naturally, leads the cast; as always, she need merely lift her eyebrow to garner laughs. Here she has contrived something of a second-rate British provincial Lucille Ball, and you can imagine how adept Ms. Martin is in that guise. In the second act, what's more, she somehow turns herself into Lucy-playing-Dame Judith Anderson. Megan Hilty can be considered a star, too, thanks to "Smash." (At the preview attended, she was the only member of the group to receive entrance applause.) She plays Brooke, the vapid actress who continually loses her dress and her contact lens. This has always been a show-stopping role--Deborah Rush was Tony-nominated for the original and Katie Finneran won the award for the revival--and Hilty succeeds handily, comporting herself like a perpetually posing beauty queen-turned-game show hostess trying to get us to choose the prize behind Curtain #3. It is in the subsidiary roles that this production is especially well favored. Leading the hilarity are Tracee Chimo, who grabbed our attention in Bad Jews and The Heidi Chronicles, here playing the wallflower stage manager Poppy; Jeremy Shamos (of Clybourne Park and Dinner with Friends) as Frederick Fellowes, an insecure actor perpetually seeking motivation and suffering nosebleeds; and Rob McClure (of Chaplin and Honeymoon in Vegas), as the stagehand Tim. It almost seems as if the casting director went through Playbills of the last few seasons with a red pencil. Also along for the fun ride are Kate Jennings Grant (The Lyons), David Furr (The Importance of Being Earnest), and veteran Daniel Davis (Wrong Mountain) as the alcoholic old-timer Selsdon. Herrin's production is slam-bang, knockdown funny. 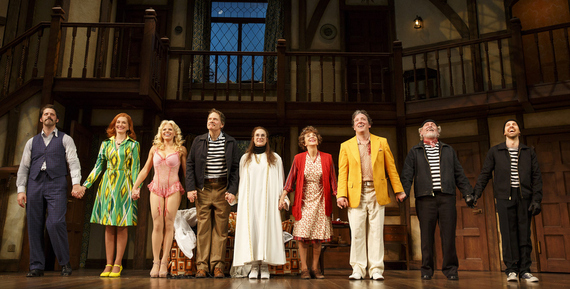 (Frayn's play, itself, is slam-bang, knockdown funny--so long as the director doesn't muck it up.) Two of the most surprising moments, here, come from unlikely places. Shamos--who generates laughter simply by wearing a ghastly, honey-mustard sport jacket from costume designer Michael Krass--offers a fine display of physical humor by falling not on a banana peel but a mound of sardines; aided by a nearby sofa, he slips and slides for far too long, as if stitched together from several "takes." Not long thereafter, McClure--with his character displaying severe stage fright--comes up with an extended bit of humor that lasts far longer, and seems all but physically impossible. McClure is and remains a capital clown, even in a relatively small role. Combine Martin's overall comic excellence with Scott's long-suffering sidelong glances and Hilty's vacuous overacting; mix them with the oblique Farr, the seen-it-all Grant, Davis chasing the prop bottle of scotch and the mousy Chimo keeping her decorum, even when she loses her dress; and throw in the aforementioned Shamos and McClure with impossibly jolly sight gags. 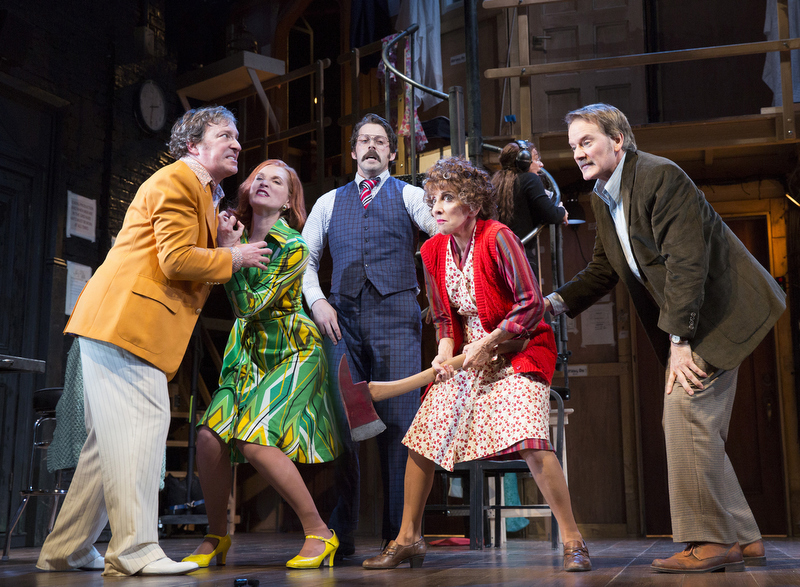 Director Herrin has pulled out all the stops with this Noises Off, with a fair share of the credit due the insanely warped mind of Michael Frayn, who dreamed the contraption up.